Hot. It is hot. Cool, it is not. How I wish it were chilly but it is hot, hot, hot, HOT. Have I mentioned it’s hot? People who hang out with me on a regular basis know some of my fave things in life. Sangria is one of those things. Sangria comes in a kajillion different ways but generally includes wine, fruit, juice and some other stuff. While I appreciate a crisp white sangria, red is my go-to. Lots of restaurants serve sangria and I must say that none of them make it better than I do. (Oh no she di-‘unt just say that!) Apparently practice does make perfect 😉 and I have finally given up ordering this when dining out as it’s just too disappointing. Everyone tries to get all fancy-pants about it with 12-ingredient-long recipes and almost always waaaaay too much sugar. Blech! I even saw a restaurant in Mammoth Lakes this summer that boasted “World’s Best Sangria!” Not even close. 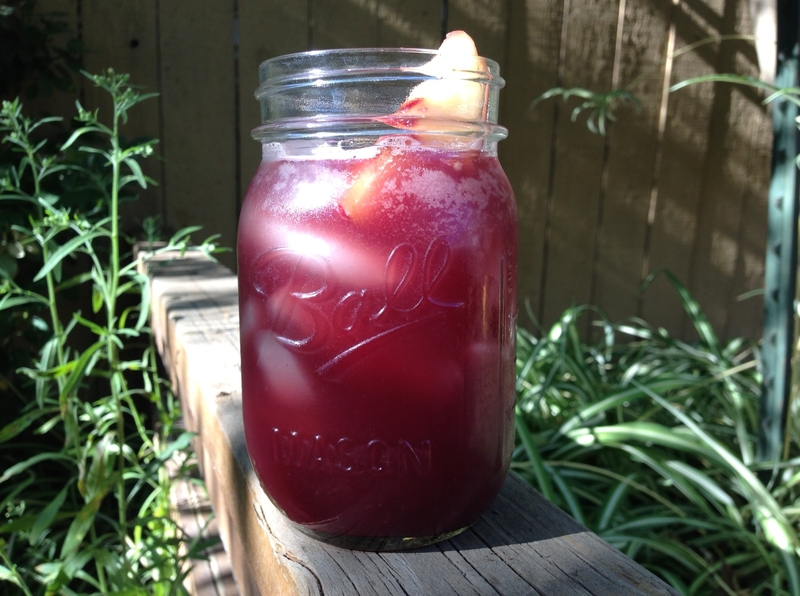 Ingredients: 1 bottle red wine, 2 cups OJ, 1 can club soda, chopped seasonal fruit (I used a nectarine and a plum here) 2 tbsp. sugar, 1-2 shots brandy or rum or triple sec. Directions: Chop the fruit and set it in the liquor with sugar for an hour or so–longer is fine. Chill all your ingredients and mix them all together, serve over ice (casually cute Martha Stewart glass jar optional) and smile. You may want to add another 1-3 tbsp. sugar to taste. Tips: Don’t break the bank on the wine. A mediocre $5-7 bottle will do fine. In the fall I make sangria with oranges and apples. In the spring with strawberries and cherries. It’s all good. Really good. 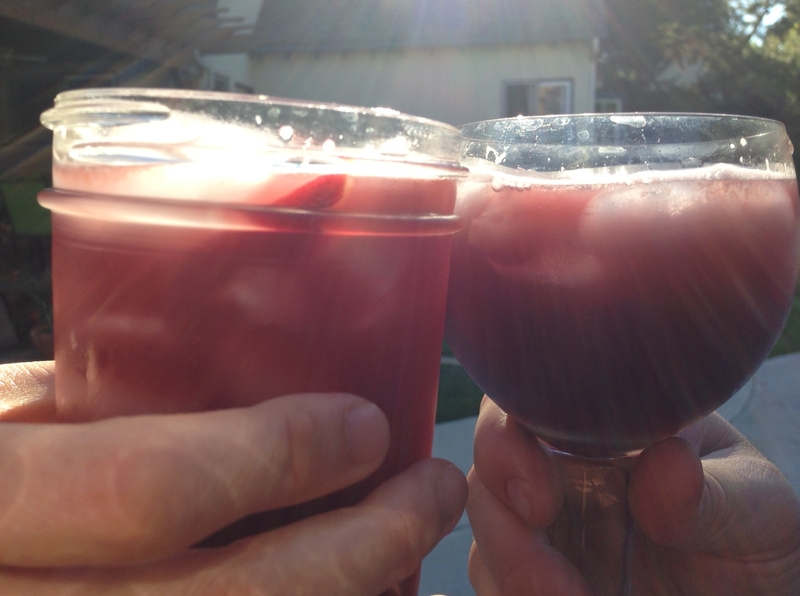 Bonus tip: Sangria always tastes better when shared with good friends, like Dale and Lisa. Cheers! Right now at local farmer’s markets and in supermarkets, apples are in season! My kiddos, likes lots of kiddos, like a good bowl of apple sauce. I started making my own when my first was a baby. 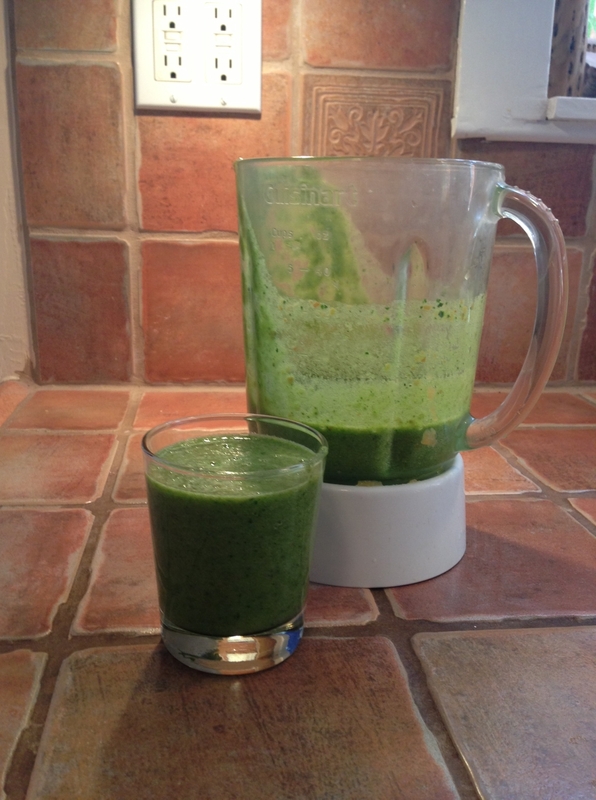 It was the first homemade baby food I ever made! I make it now because I can buy delicious, locally grown, organic apples from the ugly bin at a hugely marked down price (sometimes even 80 cents per pound! 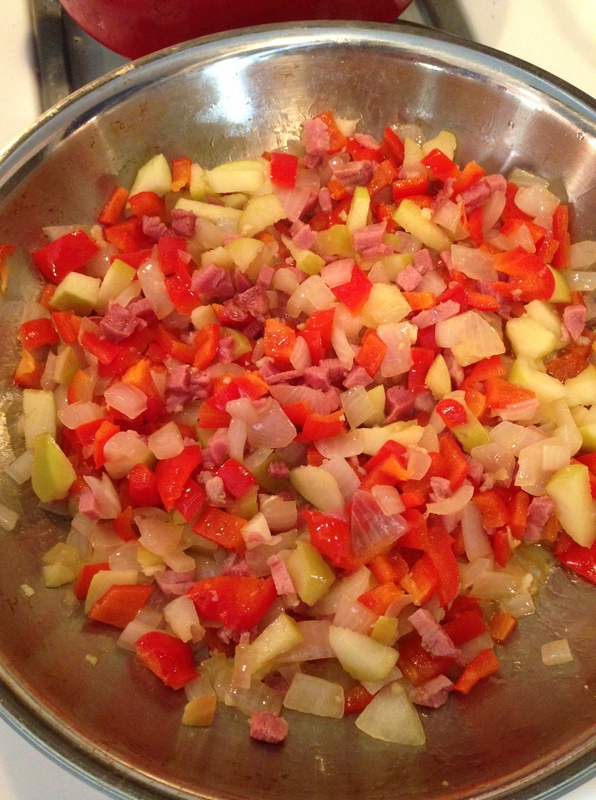 ), cut out the random bad spot, and whip up a BIG pot of yum. 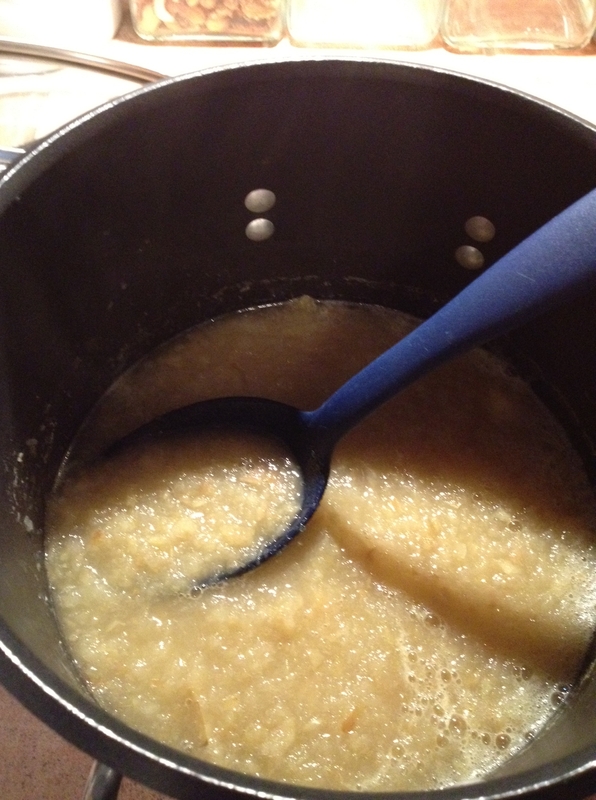 Making your own apple sauce is obviously a tad more time-consuming that opening a jar from the store, but it’s super easy, the result is very worth the effort. 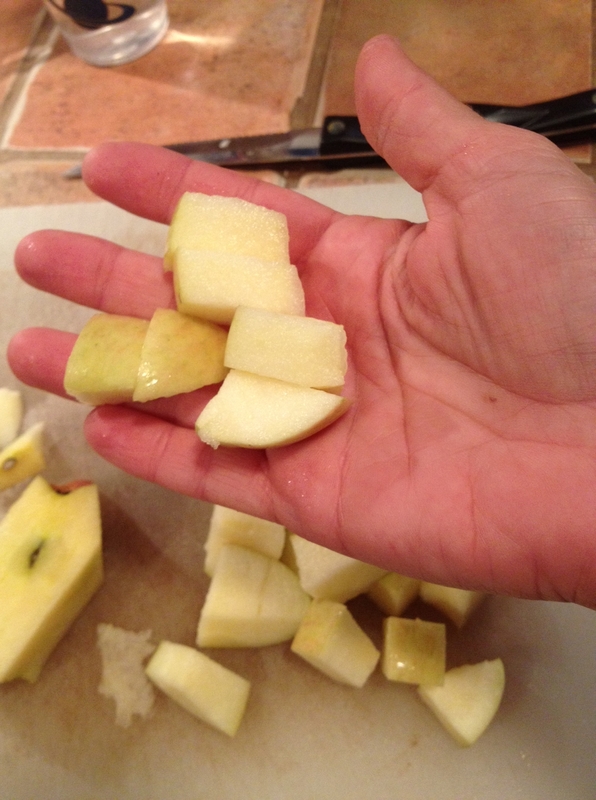 Step 1: Cut your apples into cubes, removing any offending spots. I leave the skins on. 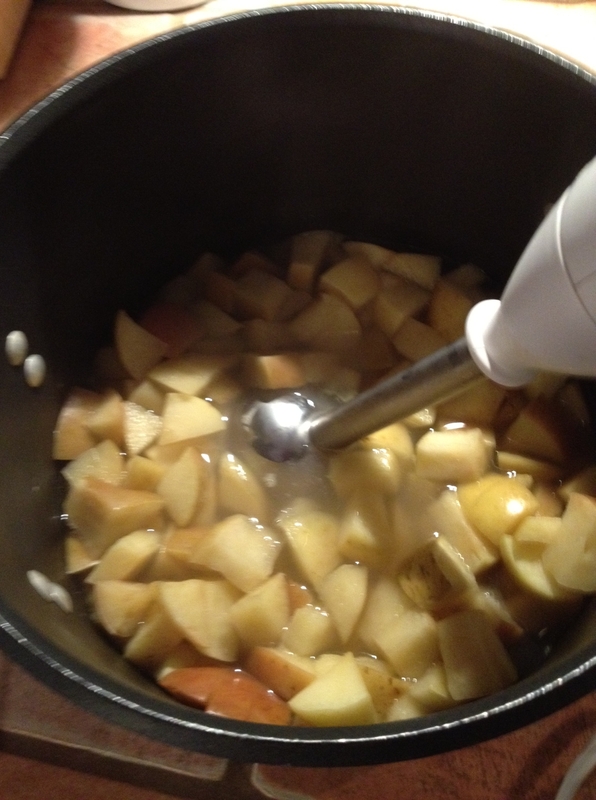 Step 3: Heat until boiling and then simmer until the apples are soft enough to mash. How long you ask? Sorta depends how many apples you’ve got in your pot. After they are boiling I test mine after about 10 minutes simmering. 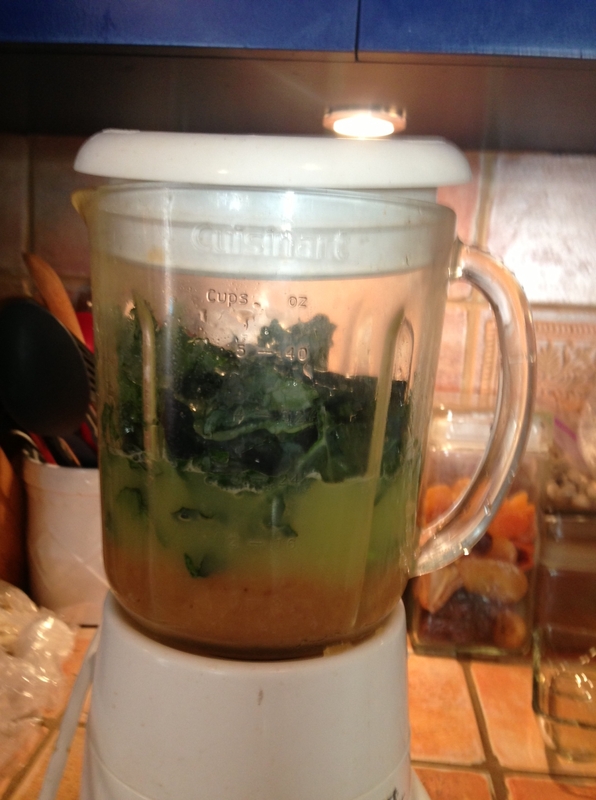 Blend it until it looks like, uh, apple sauce. In case you’ve never seen apple sauce before (I want to meet you. Where in the world are you from?) here’s a photo I took and may as well use! 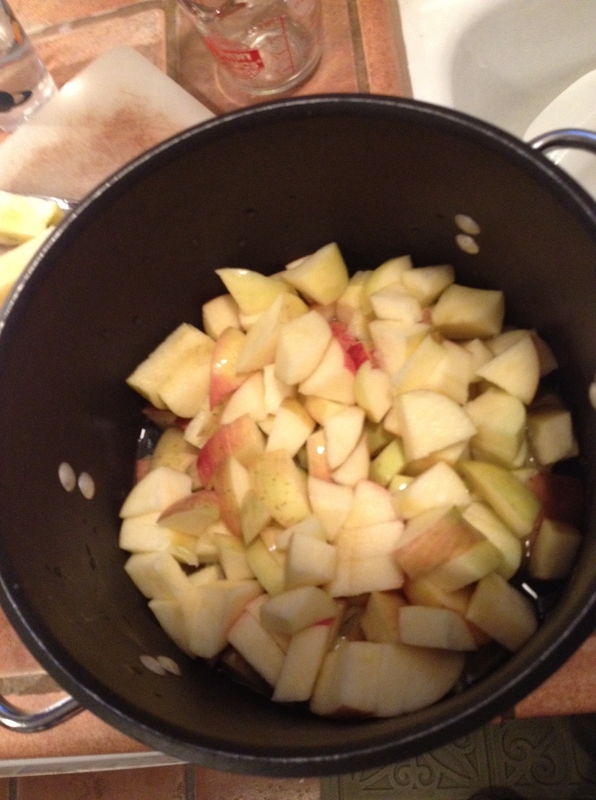 Tips: I also blend up some of this yum if I’ve purchased apples that taste mealy (I hate that, don’t you?) or have been sitting in my fruit bowl long enough to look sad. 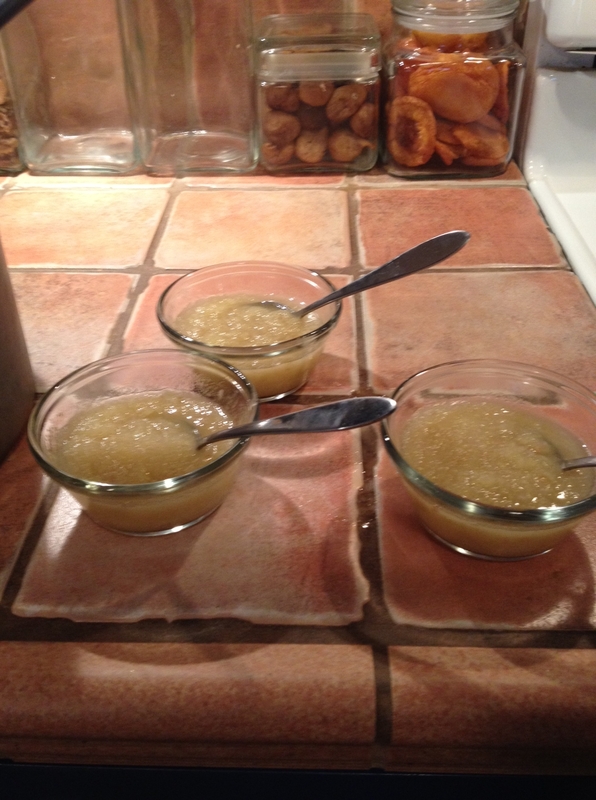 Cold apple sauce is a great snack on a summer’s afternoon, and warm apple sauce is dreamy for breakfast in the winter. 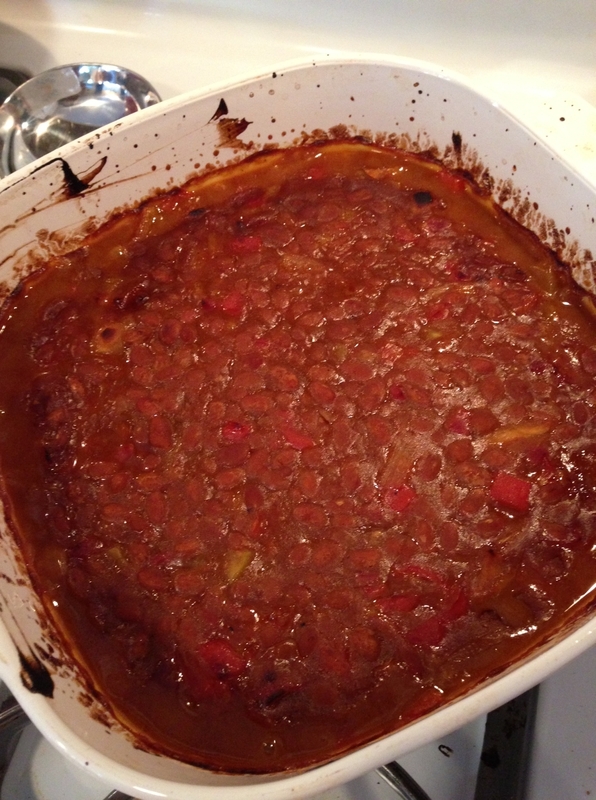 I typically make sauce with 4 or 5 pounds at a time, to make the effort worth it. 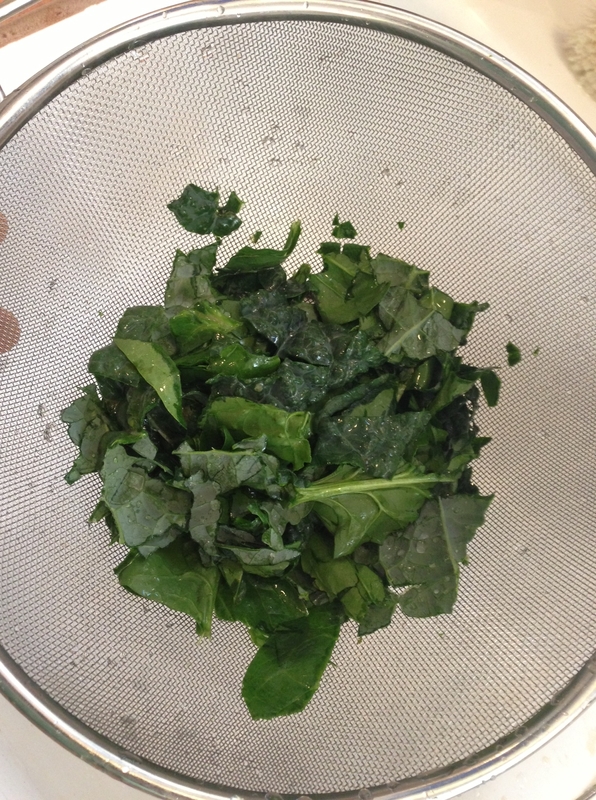 It keeps fine in the fridge for days (if it lasts) and can be frozen for longer storage. Pears or strawberries (if you have some lying around) can also be thrown in and will make the sauce even sweeter. The berries don’t need to cook for more than two or so minutes.